No. 10 TCU (17-5) squeaked out a 4-3 win over No. 8 Texas A&M (19-5) on Saturday to end its home regular season on a high note. 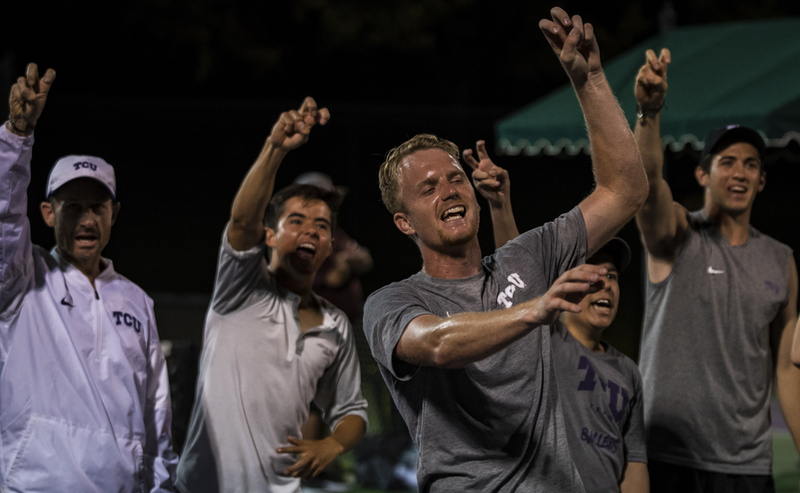 The Frogs have now won five-consecutive matches against the Aggies, including four-straight 4-3 finishes. The No. 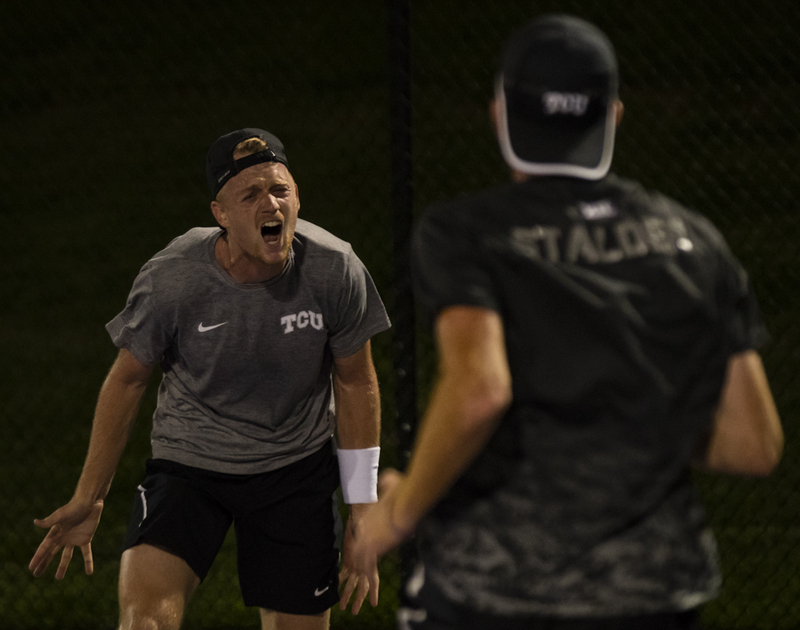 13 Reese Stalder/Bertus Kruger team continued to find its stride, winning 6-2 against A&M after defeating Texas 6-3 last week. The No. 3 doubles team of Luc Fomba and Sander Jong fell shortly after, 3-6. The team now has just two wins in its last eight matches. An Alex Rybakov/Alastair Gray victory quickly followed, marking the pair’s second win in a row as the new No. 1 doubles team. 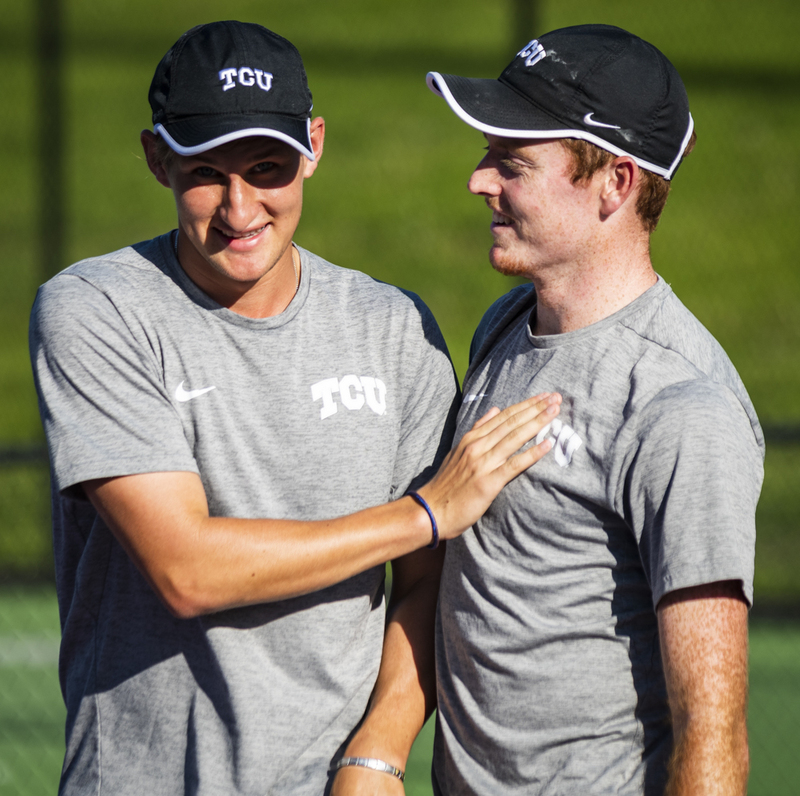 This win clinched another doubles point for the Frogs. Newly ranked at No. 110, Stalder opened up singles with a quick 3-6, 4-6 loss to conclude his home career. This loss marks his third in a row, which is his worst streak of the season. He had one loss in his previous eleven matches before this cold streak. Fomba had one of his most impressive performances of the season, bouncing back from a poor first set with a 2-6, 6-3, 6-2 win. These wins pushed the Frogs back in front overall 2-1. 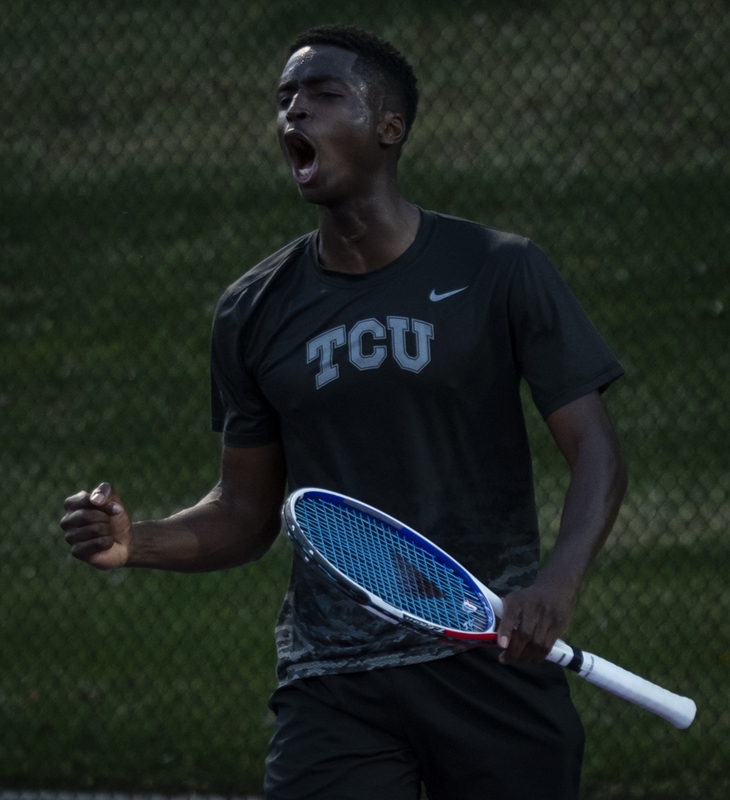 Not long after, Jong delivered another strong win, 7-5, 6-4, to leave the Frogs just one win away from taking the match. Gray continued his cold streak in conference play, falling 6-7 (3-7), 5-7 loss against the Aggies to close the gap to 3-2. Despite a solid first set, Kruger still couldn’t find a break in the second or third, and he fell 6-4, 1-6, 2-6. Those sets mark a four-match losing streak, which is his worst stretch of the season. The losses tied the teams at 3-3, putting the clinching match onto No. 4 Rybakov. 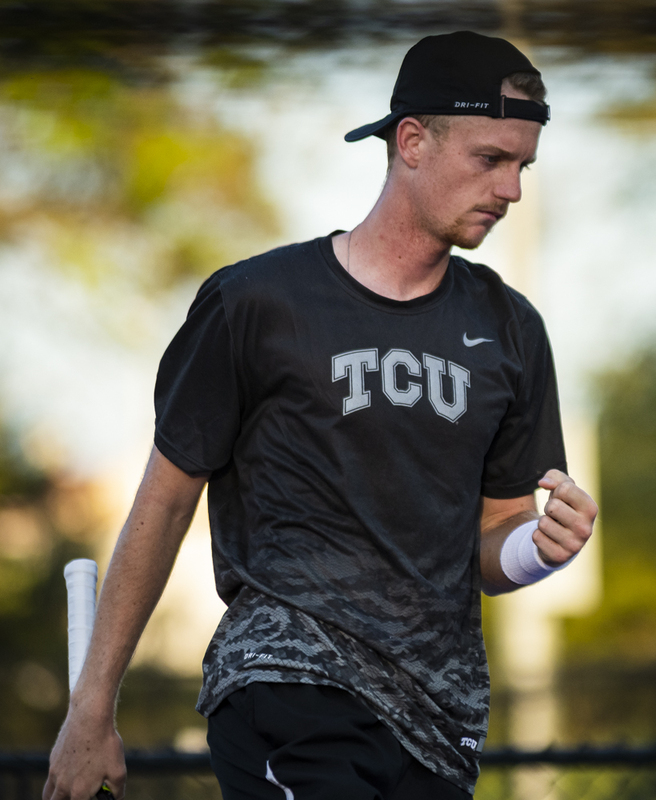 Rybakov has experience in this situation; when the team was tied 3-3 against Texas A&M in 2017, he won the match for the Horned Frogs. In a nailbiting, 7-6 (7-1), 6-7 (2-7), 6-3 finish, Rybakov repeated history and delivered one of the biggest victories of his career. This win moves his record to 13-2 at the No. 1 singles position on the year. TCU has concluded its home slate, going 12-2 in Fort Worth. The Frogs own a 64-5 home record over the last six years, including a 15-0 record in 2015 and 14-0 run in 2014. The last time TCU lost more than two home matches was 2013 when it went 8-7 at home. The Frogs will march into the Sooner State to take on No. 17 Oklahoma and No. 34 Oklahoma State this upcoming weekend to conclude the regular season.